I don’t know what is more exciting, the news that the Mackerel have returned in good numbers, or that two of my mates managed to catch double figure Bass from the shore this week. You might think that statement is mad, but the fact that the Mackerel have returned means that all the fishing should improve, including the Bass fishing. I did forecast on Monday that the Bass and Smoothound fishing should be good. What I didn’t expect was to see prediction come true so quickly. Myself and Fishing Tails photographer Gavin Parsons ran the River Cottage Shoreline course on Monday morning at West Bexington. The conditions were less rough than I thought the would be, but the water was coloured, with waves exceeding a metre in height. Almost straight away the guests started to catch Smoothound, mostly on Peeler Crab, but a few even fell to Mackerel. 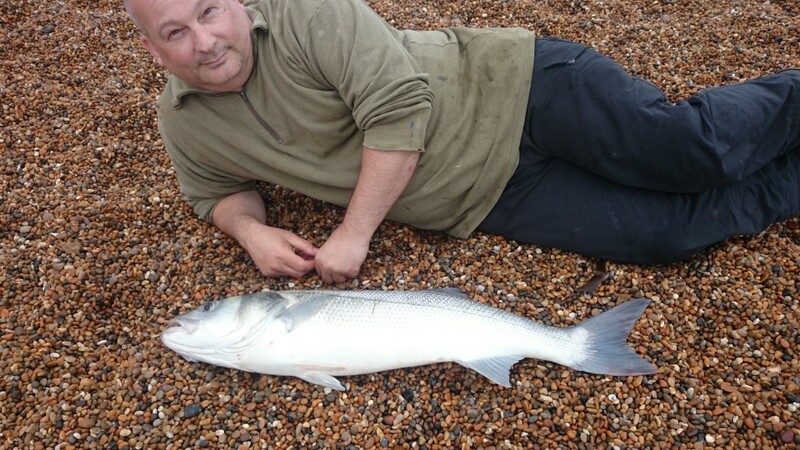 After a couple of hours, as the tide started to drop we got the first of the Bass, which fell to Peeler Crab at about 40yds out. I was pretty happy the way the morning was going, but we were rapidly running out of Peeler Crab. I suggested to some of the guests that a Mackerel Head cast only 5 or 10yds out, was the best method to use for large Bass in the summer. Unfortunately most decided to stick with Peeler Crab, as they had already had good results on those. We did catch a few more Smoothound, but no further Bass. When the guests left to return to River Cottage for a meal, myself and Gavin stayed behind to pack away all the tackle. This can often take us an hour, during which time we normally put out a rod ourselves. I went for a big Smoothound at distance, and Gavin took my advice and lobbed a Mackerel head into the surf, no more than 10yds out. Without a doubt it can be difficult to fish a bait so close in when it is a bit rough. The rod bounces around in the rod rest a lot, and you can often be mistaken in thinking you have had a bite. I told Gavin that if he got a bite he would know about it. After about 15 minutes my rod bent over, as a nice fish picked up the Peeler Crab. I struck into it and felt a considerable weight on the other end. Unfortunately it didn’t stay on for long, as the line parted just below the knot on the tapered leader. Thats not the first decent fish I have lost in this way recently. As I was standing there cursing my luck, Gavin started to run towards me. I was fairly certain it wasn’t to give me a consolation hug, especially as he charged past me with a look of excitement on his face. I turned round to see his rod bent right over. “I think it’s weed” Gavin shouted over to me. “I know its not” was my reply, as I could see a huge silver tail powering sideways in the surf. I grabbed the leader and we both ran up the beach, which was a good call, because after Gavin had unhooked the Bass he noticed that his mainline had snapped just above the shock leader. 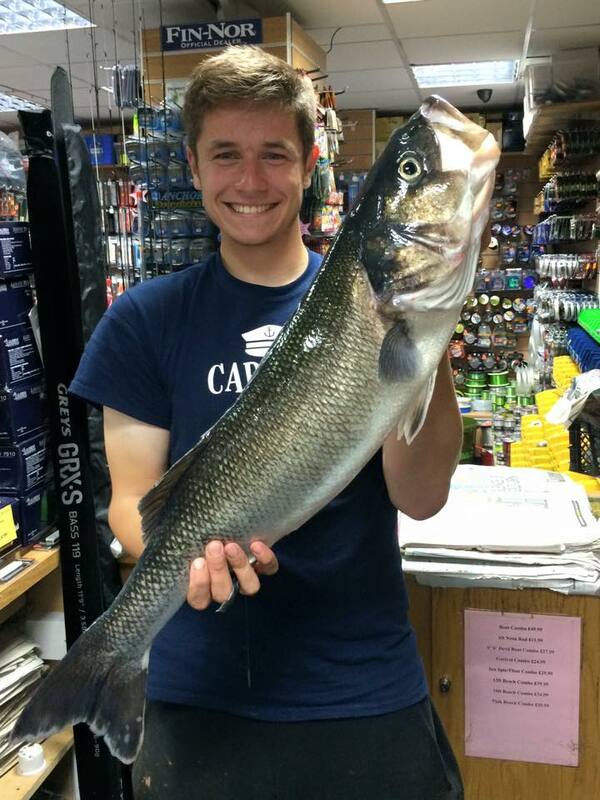 To say that he was pleased with this 11lb Bass is an understatement. Gavin was not the only one catching big Bass, my mate Ryan Casey, was at the other end of Chesil, but using the same tactics. He landed this 10 1/2lb beauty. With the return of the Mackerel, I expect to see more Bream, Gurnard, Bass and Rays. Chesil Beach forecast: After weeks of the beach not being worth fishing, I am really looking forward to the next few days. We can look forward to Mackerel, Scad, Rays, Plaice, Bream, Red Mullet and Bass. What more could you want? How about some hard fighting Smoothound. I love it that the Smoothound are around in decent numbers now. Best baits for Smoothound are live Peeler or Hermit Crabs. Now that the Mackerel are in then either use Mackerel Heads close in, or a live small Mackerel to target Bass. If you are after Rays, then a Mackerel Fillet, whole squid, Pout or Sandeel are all excellent baits. Portland: The Island is where I am going to be spending most of my time over the next few days. I will be in search of Pollock, Wrasse and Bass, in an attempt to get them all on lures and claim a Grand Slam. Marks, such as Chesil Cove and Church Ope Cove will be good for all those species. As will Portland Bill, however that is guaranteed to be busy. I will be exclusively using lures or flies, however bait will work, either float fished or hard on the bottom. Ragworm or Mackerel strip fished at dusk under a float set to around 3m in depth will get you Pollock. Portland Harbour: I expect to see small Bass and Flounder, along with a few Pollock and small Wrasse from the harbour. Bream should now be moving in close around Sandsfoot Castle and along the Rodwell trail area. 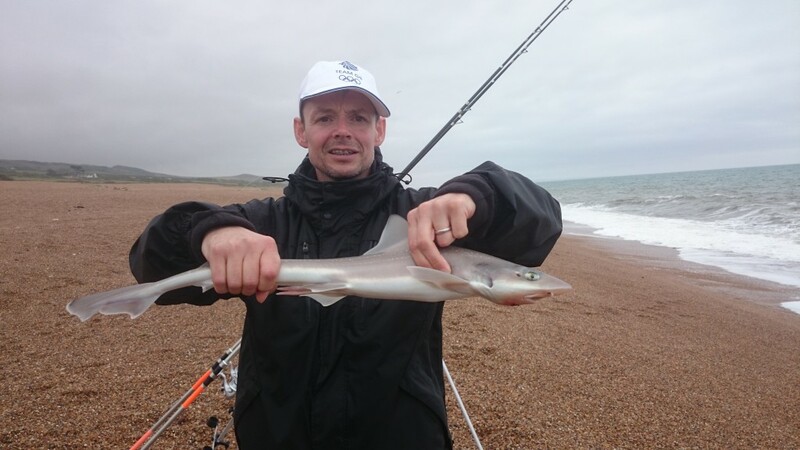 Weymouth Bay: I heard of unconfirmed reports of double figure Smoothound and a large Ray being caught at Preston Beach, with some Gurnard and small Bream showing towards Bowleaze Cove. The piers will produce loads of different species to very simple tactics. A Ragworm dropped straight down the side of the pier will have loads of fish attacking it instantly. This is a brilliant mark to introduce your kids to fishing this summer. 3 Responses to "Big Bass and lots of mackerel"
Fished abbotsbury yesterday from 8 am right though the night and packed up 6am this morning. Very few mackerel were caught, and during the day the fishing was poor. Did manage between 3 of us, hounds no bigger than 3-4lb, 1 place 1lb 1/2, 1golden grey around a 1lb, 1 red mullet, gurnards, strap eels, lots of poor cod, and a few pouting. Most fish came at darkness, All at dragons teeth. Just filleted 12 makerel from 2 hours fishing at the Portland end of Chesil last night! Looks like things are picking up! Fished just out side of padstow 19;00-22:00 off rocks using just feathers and managed 250+ mackerel in three hours. Few people saying they have had same results last couple of nights.